The first stage of the overall building process is the design phase. Bali Prefab has in-house Architects and Civil engineers team that specializes in prefab design homes, villa’s, restaurants, pavilions, and other associated buildings. The 2nd stage of the overall building process is the selection & processing of the woods and other building materials. 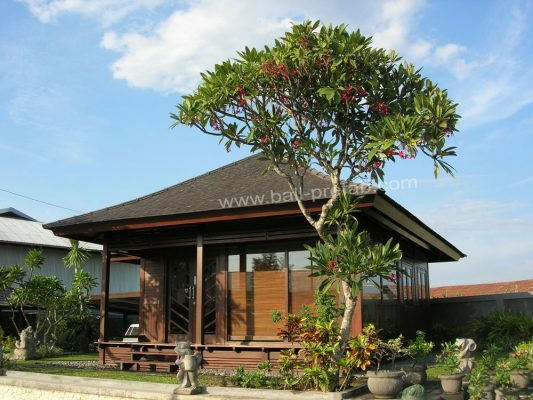 Bali Prefab uses only the highest grade hardwoods such as Merbau wood and Bangkirai/ Balau wood. These timbers are naturally resistant to termites and have the equivalent of an F27 structural strength rating according to Australian standards. Bali Prefab is fully certified with SVLK. SVLK stands for Sistem Verifikasi Legalitas Kayu, or Timber Legality Assurance System in English. It’s designed to check the legality of timber from forest through to the point of export using independent auditor. SVLK (TLAS) license guarantees that the operator/ timber industry has complied with legality standards and criteria. Companies that comply with the SVLK need to attach a V-legal Document to their shipment for export. This system requires a clear chain of custody, which ultimately ensures that customers are purchasing 100% legally harvested timber. Once delivered to our factory, the timbers are processed to various stages with our machinery. Key items such as window and door timber, flooring, decking and siding are sent to be kiln dried. The 3rd stage of the overall building process is the prefabrication and erection of the timber frame structures at Bali Prefabs huge, undercover assembly factory area. Before being installed, each house/building component is machined, hand sanded and then pre-finished to protect the timber. As Bali Prefab homes are designed so that they can be dismantled and shipped, all timber components are drilled, bolted and screwed together. Upon completion, all parts are detail labelled directly, prior to the structures being disassembled. Bali Prefab homes are not kit homes, they are fully engineered custom manufactured homes. The 4th stage of the overall building process is the finishing, packing and shipping of our tropical homes, villas, and structures to their final destination country. Upon disassembly, each component is carefully final lacquered with the appropriate finishing lacquer. For example, all exterior exposed components are finished with a minimum of Ultran Lasur (exterior purpose, alkyd-based resin). Once finished coated, all components are carefully packed with a layer of protective foam sheeting, and then packed with carton materials. The coding which is directly on the timber members is also applied to the packed componentry along with the building name and clients name. We can send our supervisor overseas to supervise the assembling process of the prefab house from Bali Prefab. This phase are optional for customer.